Fortunately, while many poisonous plants exist, horses will graze on very few of them and usually only when forage is in short supply. Their size may protect them as well. 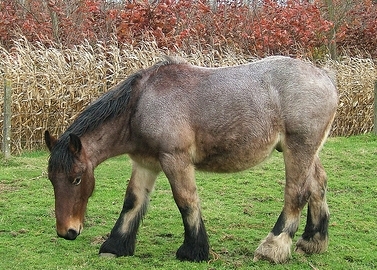 With some plants, horses must consume a large amount over a period of time to have a toxic effect. Plant toxocologist Anthony Knight of Colorado State University lists the following plants as most toxic to horses. 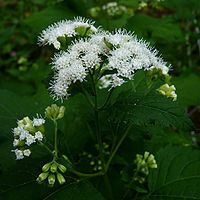 White Snakeroot is a perennial that grows 4-5 feet high in shady areas near woods and streams. The white flowers appear in late summer or early fall. The leaves, fresh and dried, are toxic to horses. Symptoms, which may appear from 3-14 days can be weakness, tremors, congestive heart failure, depression. Check areas where your horse grazes and pull the plant out by hand. Make sure the ground is cleared of all parts of the plant. Ask about a safe herbicidal control. Bracken Fern grows 2-3 feet high in woods and moist open areas. Consumption prevents the absorption of Vitamin B1 (thiamin), vital for nerve function. It causes neurological problems. Signs include uncoordinated movements, blindness, muscle twitching, depression. Caught early, large doses of B1 may help the horse recover. 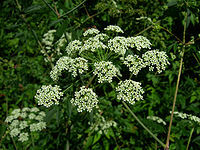 Poisonous Hemlock is a perennial weed found in open areas. Leaves are fernlike, flowers are small, white and grow in clusters. Leaves, stems and seeds contain the toxin. Symptoms are nervousness, tremors, uncoordinated movements, raised heart and respiratory rates. Lethal amount is 4-5 lbs. There is no treatment. 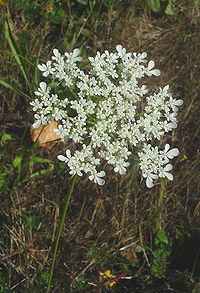 Water Hemlock is a perennial weed that grows to 6 feet with long toothed leaves, clustered fleshy roots and small white flowers growing at branch ends. 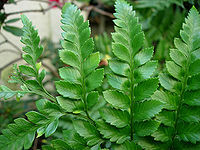 It is one of the most toxic plants and as little as 2 oz. can be lethal. It affects the brain and central nervous system. Signs are dilated pupils, salivation, difficulty breathing, affects heart and other muscles, seizures, convulsions. Death can occur in 2 hours. 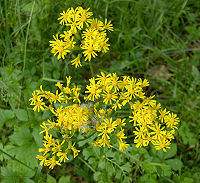 Tansy Ragwort/Groundsel is a weed that grows everywhere. It has yellow flowers that are daisylike. Signs appear when liver is damaged – weight loss due to loss of appetite, uncoordination, jaundice. Consumed over a period of time, it causes irreparable liver damage. There is no treatment available. Yellow Star Thistle/Russian Knapweed – Both can be found in fields and along roads. Both grow to about 3 feet. 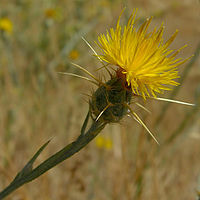 Yellow Star Thistle has yellow flowers surrounded by spines. Russian Knapweed has no spines and flowers are white to purple. Both plants contain toxins that affect nerves and control chewing. Signs are tense facial muscles and weight loss. Damage is permanent and there is no treatment available. 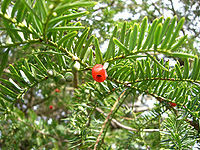 Yew is an evergreen shrub with needle-shaped leaves and red or yellow berries. All parts are toxic except the flesh of the berries. Even consuming one mouthful is deadly in minutes. There is no treatment and sudden death commonly occurs. 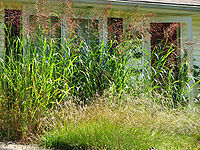 Johnson Grass/Sudan Grass can grow to 6 feet tall and have branches of seed heads. Both grasses contain a cyanide compound, young plants being the most potent. Injury to even adult plants releases high levels of cyanide. Dried grasses cured for hay are safe unless nitrates are present from over-fertilization. Symptoms are rapid breathing, tremors, urinating and defecating frequently, convulsions. If poisoning is not severe, drugs can be administered to aid recovery. Locoweed is a many-leafed perennial that grows in tufts in any soil. Flowers are white, blue or purple on leafless stalks. Signs are strange gaits, head-bobbing. Horses may stagger and fall. Horses that don’t have more access to the plant can recover but there is no treatment in severe cases. 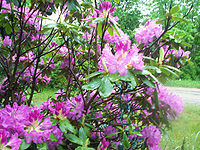 Oleander, Foxglove and Rhododendron all have similar effects on horses. 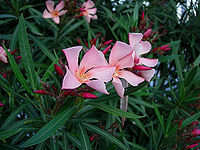 All parts of oleander are toxic and leaves remain toxic when dried. Signs can occur within hours and are arrhythmia (irregular heartbeat), problems breathing, tremors, colic, lying down, slow or rapid pulse. If treated early with activated charcoal to absorb toxin and anti-arrhythmia drugs, horses can survive. 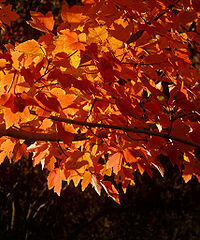 Red Maple Trees have red stems and green leaves in spring and summer which turn red in fall. Bark of the tree is pale grey that darkens with age. Dying and fallen leaves are highly toxic to horses causing red blood cells to lose oxygen and affecting all organs. Depending on how many leaves are ingested signs can appear within hours or 4-5 days. Symptoms are inappetance, lethargy, dark reddish-brown or black urine, pale yellow gums and mucous membranes becoming dark brown, rapid heart rate, dehydration. Treatment is heavy doses of intravenous fluids and blood transfusion if necessary. Recovery depends on amount of leaves consumed. 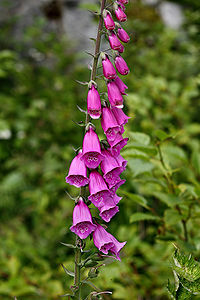 While these are the worst toxic plants in the group, the list of plants potentially poisonous to horses is staggering. The ASPCA has a complete list of plants toxic to horses. Since there is no treatment for the most severe toxins, areas where horses graze must be checked often and carefully to avoid disastrous results. 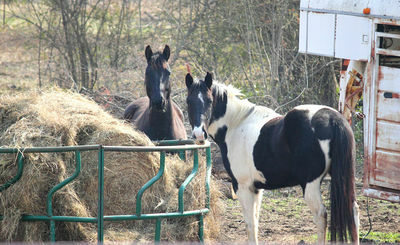 Providing plenty of fresh feed for your horse is also a deterrent to them eating toxic plants.